Carolyn and Leonard Anderson of Oquawka are both retired from their away-from-home jobs, but that doesn't mean they are now without something to do. Carolyn, who was a P.E. teacher at Union and West Central for many years, and Leonard, who worked as a J I Case employee, both still have a lot of energy for work at home. Plus, the two both enjoy taking something that has been "retired" and making it into something meaningful and special. While doing this, they have found they can improve the space they live in and do something good for the environment while kicking back in a more relaxing way at home. The end of June, the Andersons opened up their yard as part of the "Dirty Hands" Garden & Art Walk which is annually held the end of June in Oquawka. Located at 512 N. 2nd street, people could enjoy meandering through a yard of more than 200 Hostas, each different, each well maintained in different shaded garden settings. They are arranged in gardens according to their names. One spot, for instance, is names of things Carolyn has done, like embroidery, quilting, stain glass, Great Britain, others may have a theme. She has gardens for butterflies, gardens for hummingbirds, some with names of people. Each hosta has a name tag, its own separate place and, is surrounded with red mulch to pop out the green color of the leaves. Each garden also has its own water source for birds and butterflies. These sources are handmade by Carolyn either by gluing glass bowls or candlesticks together, or using leaves to give her own artistic flare. For one she used a huge leaf from a Lotus plant as a mold using cement and some paint. Those all too easy to break gazing balls, are not so easy to break at the Andersons. She has recycled a large Christmas bulb, and a very heavy bowling ball to make them. One is made with broken little squares of mirrors, another from broken glass. A weathered shed was taken advantage of with an old time garden nook feel adding shelving, a fence, some pots, and a herb garden is close to the kitchen door. Between the deck and the garage, Leonard helped Carolyn create a waterfall and fish pond. They obtained rocks from friends' country homes and stocked it for a most relaxing and entertaining area as guests walked from the drive to their back door, or as they sit on the back deck for a relaxing evening. Leonard has probably lit up the place the most with his creations. With the help of their engineering son Ryan, he has transformed several gas pumps into yard lights. Two of them have sentimental value as he had at one time pumped gas while working at a Standard station in Oquawka and the other was one his dad had pumped from while working for the city. Leonard obtained it in a sealed bid when the city sold it. Since purchasing his first two, he has bought several. In the picture is one of the first gas pumps produced, a 1929 WAYNE, which is a visible gas pump, that had to be hand pumped and works by gravity. It still has the original blue tint glass to read how much gas is going into a vehicle. This was the first pump that was wired for lighting of their yard at the Andersons and lights your way as you drive into their driveway. If you have lots of shade, plant hostas, as Carolyn Anderson has found that they come in hundreds of varieties. She has over 200. 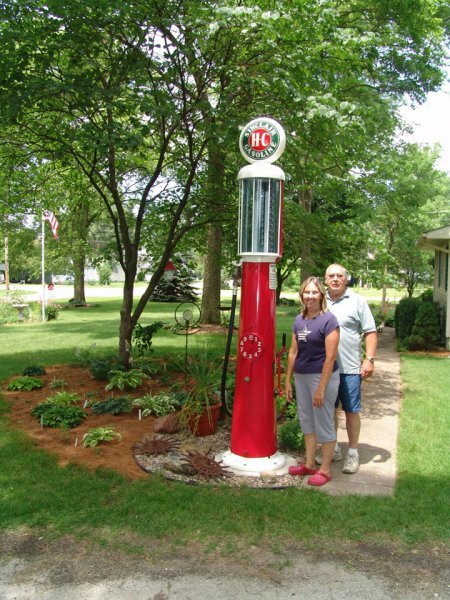 Her husband Leonard, enjoys converting old gas pumps into lights for the yard.